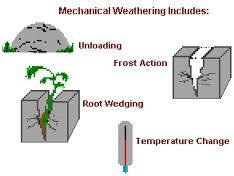 This article focus to discuss on the Processes of Mechanical Weathering. The formation of ice in the myriad of tiny cracks and joints in the rock’s surface slowly pries it apart over many years. Frost wedging results once the formation of ice widens in addition to deepens the cracks, bursting off pieces and slabs. Frost wedging is more effective in those climates which may have many cycles of cold and thawing.